When I applied for a job 22.5 years ago after graduating from the Carl von Ossietzky Universität Oldenburg in Germany I don’t think I would have imagined in my wildest dreams something I’m doing now. And with that I’m not talking about recovering from heart valve surgery. Said job turned out to be in Swindon in England while I had been born in Germany and had lived most of the next 26 years in Germany (apart from almost a year in the US for an internship). In early 1995 I boarded a ferry to Harwich to start what at that point I probably thought was going to be just an episode in my life. I don’t know for sure but I think most if not all of the other foreign hires hired at the same time have long since returned to their countries of origin. But 22 years later I’m still here (with one short interruption 1998-2000 where my then employer sent me to Munich in Bavaria. Which as a northerner born in Bremen is a foreign country as far as I’m concerned). I’ve changed employer and I’ve moved home from Swindon to Aldermaston Wharf, but otherwise I’m still here. 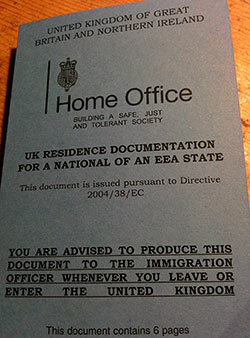 Having been in the UK for so long I had started to think about it a few years ago: Naturalisation. Applying for citizenship. I feel the UK is my home now. Germany feels more and more like a foreign country (especially as I only go back to Germany a few days every year, if that. There have been years where I didn’t go at all). I find myself defending my chosen home against unjustified (and sometimes even justified) criticism. I find it more natural to speak, write, think and dream in English than in German. But apart from reading up on it a bit on the internet I hadn’t done a lot about it just yet, it was just on the radar. Then the Brexit vote came along. The Brexit vote changed a lot. For a number of people I know it means they don’t feel welcome here any more. Some are making plans to move back to their country of origin (or elsewhere), others I think have even already done so. For me the plans I’ve had in the back of my mind have become more urgent. I’ve decided to stay and sit it out, make the best of it. I might regret it if the UK really goes down the drain as is entirely possible. I’m strongly against Brexit (as are millions of others, which is often forgotten) and think it’s one of the dumbest ideas ever. But I don’t feel it’s right to run away from the place which has become my home, with all its faults. I don’t feel it’s right to run away from all my friends which have given me enormous support and mean a lot to me. So I’ve decided to push ahead with naturalisation. The first step of that was to apply for a Permanent Residence Card. After a few weeks of gathering all the required evidence that I had legally and lawfully lived in the UK while exercising EU treaty rights (or something along those lines) I sent off my application in very early October, just before I left for the hospital for my operation. Then the nervous big wait began. I had read that processing an application could take up to six months (especially since the Brexit vote as the Home Office has been inundated with applications) and that in some cases applications were rejected for formalities. Today the both dreaded and anxiously awaited large A4 envelope (because of all the documentation to be returned) was sitting in my letterbox when I arrived home. When I ripped it open as soon as I was up in my flat one of the first things I saw was what you see in the picture. Relief, everything was fine. Step 1 of the journey is complete, I’ve obtained my Permanent Residence Card. A few days ago the press was full with reports about a drone allegedly hitting a plane (see BBC, Telegraph, Guardian). The reports all called for tighter regulations, more controls, they predicted dire scenarios of planes crashing if nothing was done, yet hidden in the articles it was also is mentioned that the plane was ‘believed to be hit’ and that no debris off a drone had been found. In other words, there was no proof of a hit. I was sceptical of the reports when they first surfaced for a number of reasons. To start with the reports indicated that there was little or no damage to the plane which contradicts the claims of dire consequences should a plane be hit. Surely if the plane had been hit there would have been damage? Next the reported height of 1700 feet when the plane was hit. While not technically impossible it is quite difficult to reach such heights with a standard consumer drone. The newer models of the DJI Phantom (a picture of which is usually used to illustrate the reports) all have built-in height restrictions below the levels indicated in this report and many other sightings. Admittedly these can be hacked and overwritten, also older models don’t have this restriction. However, the ability to reach and maintain such heights is severely limited by in particular the battery capacity of the drones. If if a consumer drone was to reach these heights it almost certainly would only be able to remain at that level for less than a minute before having to descend or even descend automatically to ensure a safe landing with enough battery capacity. Then the calls for tighter regulations including an US style drone registry. To start with there is already regulation requiring drone operators to only fly at safe heights and not near any airports. I firmly believe that the majority of people flying a drone will follow those rules, but as with pretty much anything there will always be some idiots will break the rules and ruin it for everyone (just think of the people driving vastly in excess of the speed limit or texting while driving, which in many cases has led to deathly accidents). A drone registry would only be helpful if any identifiable debris of a drone had been found, otherwise what would you look for to identify the owner? In this case nothing had been found so there was nothing to identify. Now the first reports are starting to surface that the alleged hit might not have happened at all or that the alleged drone might have been a plastic bag. There was no damage to the plane at all, not even a dent. Still no debris has been found. All this indicates that almost certainly there was no strike, most likely not even a drone. Transport Minister Robert Goodwill in my eyes reacts very sensibly and seems to have a very good understanding of the situation. Tighter rules won’t stop terrorists and will only have a limited impact on reckless idiots (see the earlier mentioned speeding and texting). The technical limitations of a drone (e.g. battery capacity) will make it much more likely for terrorists to use other, simpler means to achieve their goals. Of course there should be continued education about the rules and safe flying for all drone users as well as punishment for reckless idiots, but both of that is already happening as various press reports indicate.